We hear a lot these days about protecting the heart. We also hear a lot about protecting our brains. But what about your kidneys? According to new statistics, we need to pay better attention to our kidneys. The CDC (U.S. Centers for Disease Control and Prevention) just released some startling statistics about kidney disease. An amazing one in seven men and women in the US have chronic kidney disease! That means that statistically you and I have a one in seven chance of being one of this not-so-illustrious group. This is much higher than was previously thought. And according to Kevin Longino, CEO of the National Kidney Foundation, the statistics should "serve as a warning bell that a major public health challenge is right in front of our eyes and more must be done to address it." And that's not even the worst of it. According to the CDC, about 96% of those with early kidney disease don't even know they have it. 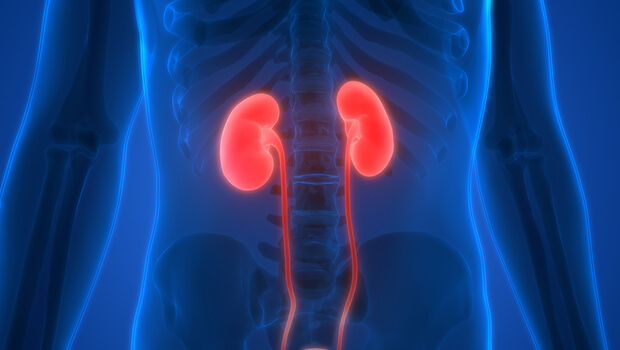 Almost half of those with severely reduced kidney function don't know there's anything wrong. This is one of those silent diseases that doesn't ring the doorbell until it's too late to do much about it. So, what can you do to make sure that someday you don't hear that ring? One important thing is to have your kidney function checked on a regular basis. Have your doctor order an eGFR, a serum cystatin c test, and a urinalysis every year. Chronic kidney disease is easy to treat if you find it early. But it's very difficult once it has progressed beyond a certain point. Next, make sure you drink at least two liters of pure water every day. As far as your diet goes, the most important thing is to avoid processed foods, junk foods, and sweets, and keep your blood sugar in a healthy range. Your A1c level is the best measure of your blood sugar. Make sure that you keep your carbohydrate intake low enough to get your A1c below 5.5%. They use a 5,000-year-old formula that works even when conventional remedies fail. Modern studies show it works! One of the most common causes of chronic kidney disease is untreated high blood pressure. So, check your blood pressure every now and then, and make sure it's in an acceptable range. You can refer to the archives for more information on how to check your blood pressure and what the numbers should be. And be careful of drugs. According to a review article published in 2014 titled, "Our prescription drugs kill us in large numbers," the author states: "Our prescription drugs are the third leading cause of death after heart disease and cancer in the United States and Europe." It's an alarming fact, but it's a fact nonetheless. There are three classes of drugs that are a particular problem for the kidneys. One class of drugs is the proton pump inhibitors (PPIs). These are commonly used for heartburn and reflux symptoms. Here is a list of the most common PPIs: Omeprazole (Losec, Prilosec, Zegerid, Lomac, Omepral, Omez), Lansoprazole (Prevacid, Zoton, Inhibitol, Levant, Lupizole), Dexlansoprazole (Kapidex), Esomeprazole (Nexium, Esotrex), Pantoprazole (Protonix, Somac, Pantoloc, Pantozol, Zurcal, Pan), and Rabeprazole (Rabecid, Aciphex, Pariet, Rabeloc, Dorafem). There are natural ways to cure reflux and heartburn (one of my favorites is melatonin), and there are safer medications to use than PPIs. Refer to the archives for more information. And if you don't have Parkinson's but do suffer from occasional constipation, this is a good choice for you as well. Constipation is not only aggravating, I believe it can also be dangerous to your body over the long haul. The other class of drugs that can damage the kidneys is the statin drugs. According to a study in the British Medical Journal, people who take statin drugs, particularly high doses, are much more likely to be hospitalized for acute kidney injury than their statin-free colleagues. The third class of drugs are the NSAIDs, such as Advil and Aleve. Continuous use of these drugs is known to cause kidney damage in susceptible men and women. You can safely use these drugs every now and then. But don't use them on a regular basis. So, pay attention to your kidneys. Don't take them for granted. One in seven American adults amounts to about 30 million people! So, please take these simple precautions. If you do, you are much more likely to be in the six out of seven people who live their lives out with healthy kidneys.